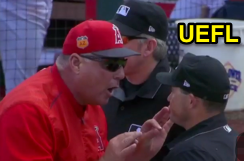 HP Umpire Mike Cascioppo ejected Los Angeles Angels of Anaheim Manager Mike Scioscia (strike one call) in the bottom of the 3rd inning of the Diamondbacks-Angels game. With two out and none on, Angels batter Cameron Maybin took a 1-0 pitch from Diamondbacks pitcher Taijuan Walker for a called first strike. Replays indicate the pitch was located around the inner edge of home plate and near the hollow of the knee (pitch f/x unavailable), the call was irrecusable. At the time of the ejection, the Angels were leading, 4-1. The Angels ultimately won the contest, 7-4. This is Mike Cascioppo (-)'s first ejection of Spring Training, the 2017 MLB preseason. Mike Cascioppo now has 0 points in the UEFL Standings (0 Previous + 0 Spring Training = 0). Crew Chief Mike Winters now has 0 points in Crew Division (0 Previous + 0 Spring Training = 0). This is the ninth ejection report of Spring Training 2017. This is the 2nd Manager ejection of pre-season 2017. This is LAA's 1st ejection of Spring Training, 2nd in the Cactus League (CWS, LAD 2; LAA 1). This is Mike Scioscia's first ejection since September 20, 2016 (Pat Hoberg; QOC = U [Throwing At]). This is Mike Cascioppo's first career MLB ejection. Wrap: Arizona Diamondbacks vs. LA Anaheim Angels (Cactus), 3/25/17 | Video via "Read More"